Before American Dad’s month-long break, it had a string of episodes that dealt with emotion in a more honest fashion than I’m used to seeing outside of The Simpsons. Sure, it’s a certain brand of quip-heavy sitcom emotion, but it has felt particularly resonant in the latter half of this season. “Ricky Spanish” is not that kind of emotional episode. It goes full-tilt into indulging Roger’s obsession with costumes, uncovering a lost character so vile that whenever his name is uttered, the show cuts to a still of him doing terrible things, ranging from the mildly rude act of not holding an elevator to defecating into an open surgical cavity. When he brings out the Ricky Spanish outfit—since its perfect for going to get yogurt—everyone starts to follow him, forming an angry mob. This guy clearly did some terrible things Roger doesn’t remember, since even Frankenstein gets in on the mob. This gets Steve worked into a My Name Is Earl mood, as he helps Roger make a list of all the people he wronged as Ricky Spanish—including Principal Lewis and a very angry prison inmate—in order to win their forgiveness. The bit at Avery’s house is a nice detour, showing the CIA man in fits of cocaine-fueled insanity, and when Steve and Roger visit a judge, we find out another life that Roger has led for years. Ricky Spanish starts to go to Roger’s head though, as he indulges in one last caper, stealing cashmere from a Plantain Republic, and framing Steve in the getaway. This illustrates a crucial distinction for the character: Roger doesn’t possess the same capacity for emotional revelation that the episodes in this last good stretch have shown. Stan is able to shut down the more self-centered and stubborn aspects of his personality to learn a lesson, but Roger only goes further into his self-obsessed, vain attitudes. Unfortunately, there’s not much here to distract from the character’s lack of shading: The B-plot of “Ricky Spanish” is a dull one. 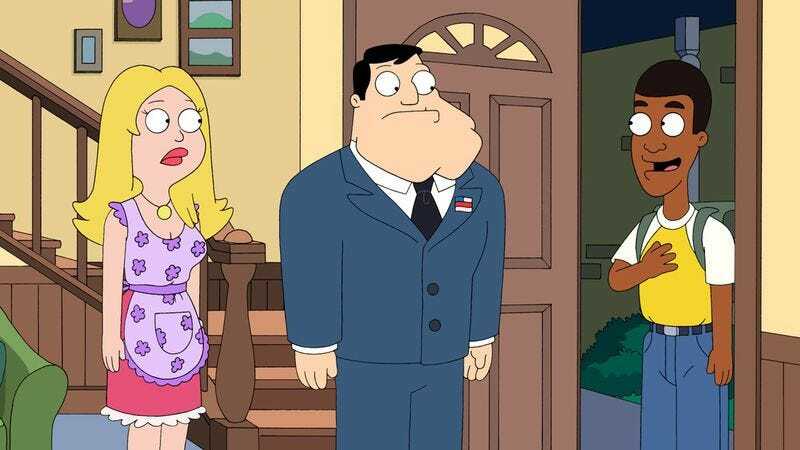 Stan and Francine sponsored an African child, and he shows up on the Smith’s doorstep looking for a permanent place to live. His existence shatters Stan’s idea that Africa doesn’t exist, and the guy starts to ruin Stan and Francine’s ability to take things for granted. It’s pretty annoying stuff, especially when the Smiths ditch the kid they helped with such a meager contribution at a Costco-esque store, only to miss him and go back for him, and then backpedal on that separation anxiety immediately once they’re back in the car. It’s a quick, simple side story that made me laugh once or twice, but felt lacking. The final few minutes are fantastic, as the episode takes a wild leap and becomes a Werner Herzog documentary, with split screen comparisons and soothing, whimsical narration from the famed filmmaker. Steve is like the butterfly, but survives and gets out. Sure, it’s a tacked-on, completely ridiculous way to punt an actual ending, but it’s also really funny. Not every episode of American Dad will pack an emotional wallop, and this was a light, breezy romp through Roger’s penchant for dress-up that had plenty of laughs and nothing egregiously grating. I rarely like the kind of direct address gags that call attention to the fact that certain characters aren’t featured in an episode, so Hayley and Klaus popping in to announce they were now getting paychecks didn’t work for me at all. Steve really has the wrong idea about why the last few seasons of Saturday Night Live have been worth watching.